In business, like in sport, you need to keep score. Keeping score tells you whether you’re winning or losing. Balance sheets and profit and loss statements are like your scoreboard; it shows you what parts of your business is profitable and where all your money goes. You should sit down with your team and discuss what parts of the business are making the most money, and whether you can cut costs by finding new suppliers or offering new services. That way you can project your cash flow and decide what your next steps are. Using business finance to fund long-term assets can have a dramatic impact on your cash flow, especially if you require new assets to fund your business activities. “All businesses require capital, and business finance is often a capital source that comes with a fixed cost. This means your cash flow accounting can become more predictable, even during slower periods,” says Savvy CEO Bill Tsouvalas. Often business finance can be in the form of loans, overdrafts, or lines of credit. Ask a friendly consultant to see if business finance is right for you. A common trap business falls into is using short-term liabilities to pay for long-term assets. This might be using cash on hand to pay for large purchases, such as cars or machinery. A rule of thumb in business is to use long-term loans for long-term assets – if you intend to use a car for five years, take out a five-year loan. Other liabilities, such as tax liabilities, can also be deferred or divided into payment plans, which can also have a positive effect on cash flow. If you have a lot of inventory that’s going unsold, you should offer a discount to help liquidate these assets as quickly as possible. If you aren’t selling inventory, you are paying for it by storing it longer than you need to. Though you may take a hit on getting maximum profit, you will free up any logjams in cash flow – you can even use this cash to invest in new or different stock. If you’re a service business, consider offering a limited-time discount on your services. If your business provides services with a long sales cycle, such as managed services, you will gain more cash from long-term clientele over time. 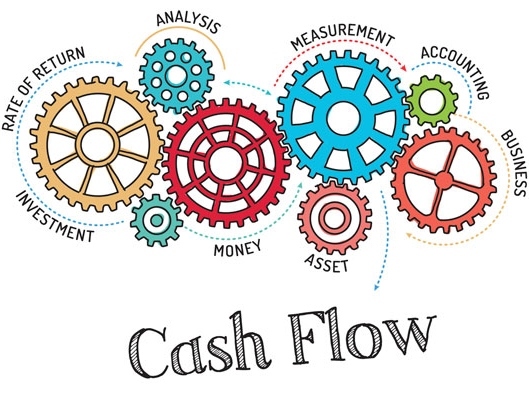 Some businesses run into trouble with cash flow by having long payment terms. This especially evident for service-based businesses, as some will only invoice after the job is complete, which means waiting 14, 30, 60 days for payment. To help cash flow, insist on taking a percentage deposit before delivering your goods or services. You can offer a discount on early payment such as 2/10 NET 30, which offers a discount of 2% to your buyer if they pay within 10 days. This can also foster longer-term relationships with buyers who may take advantage of your early payment discounts.